I am sure that everyone in the world with an email address has received dozens, if not hundreds of "Nigerian Scam Letters". They are now spreading beyond Nigeria, and coming from e-mail addresses in other places, including Europe and the UK. Did you know that this is not a new phenomenon? Most authorities will tell you that these "Nigerian 419 letters" (named after the legal code that applies to them) are a modern version of the very old "Spanish Prisoner" scam - a term that I am sure few people would have heard before the 1997 David Mamet film of the same name. The idea behind these scams is that a valuable piece of property is being held by authorities, or in secret storage and needs some "bailing out", by the payment of bribes, storage fees, court costs, or some other excuse. Of course the entire scam is intended to extract this "advance fee" out of the unsuspecting (but greedy) victim, and to keep doing so with further "complications" until the victim is bled dry, gives up, or makes the (sometimes fatal) mistake of going to meet the con artists and putting himself in their power. The item was, of course, usually illegally (or at least semi-legally) acquired, encouraging the intended victim to maintain secrecy. This leads to two questions: What has this to do with philately? and "Why was the old version called the "Spanish Prisoner" scam? An item I found recently should answer both questions at once. 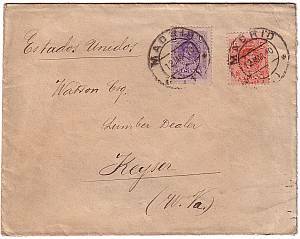 This cover was mailed from Madrid Spain, to Keyser, West Virginia, USA on March 12, 1910. It is franked with 10c and 15c values of the King Alfonso XIII stamps of 1909, paying the common 25c UPU rate to the USA - nothing special so far. The surprise was inside. I actually began to collect some of the Nigerian scam letters before they became so commonplace. I even have a few of the - pre-email versions that were actually mailed. Imagine my delight when I looked inside this Spanish en velope and found an original Spanish Prisoner letter! Although I know you only from good references of your honesty, my sad situation compels me to reveal [to] you an important affair in which you can procure a modest fortune, saving at the same time that of my darling daughter. I beseech you to help me to obtain a sum of 480,000 dollars I have in America and to come here to raise the seizure of my baggage, paying to the Registrar of the Court the expenses of my trial and recover my portmanteau [ed. note: literally, "coatrack"] containing a secret pocket where I have hidden the documents indispensible to recover the said sum. As a reward I will give up to you the third part viz. 160,000 dollars. I cannot receive your answer in the prison but you must send a cablegram to a person of my confidence who will deliver it to me. A recent scam letter - one of the best ones I have seen that arrived in September 2003 from a United Kingdom email address. More reading about Nigerian 419 letters with additional links.